Welcome to Cox Chevy in beautiful Bradenton, FL. Cox Chevy is the greater Tampa and Sarasota area’s premier Chevy dealership, and we go the extra mile for everyone we work with. That’s why we were named a 2014 Chevrolet Dealer of the Year. If you are looking for a massive new car inventory, competitive prices, friendly service, and no-pressure sales, make Cox Chevy your destination. We would be happy to add you to our long list of satisfied customers. Sales are not the only area where we excel. In fact, we have customers that travel from Sarasota, Tampa, and beyond to access our service center. Our service department is well equipped with the latest technology, expertly staffed with GM-certified technicians, and committed to customer service. If you need routine maintenance, major repairs, or just a part, you are covered. The Cox family has been in the automotive business since the early 1900s and has been at our present location at 2900 Cortez Road West in Bradenton since 1978. We’ve thrived for five generations by putting the customer first. 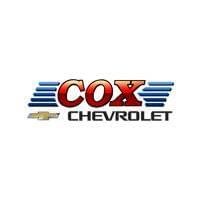 When you want to make one trip to get all your automotive needs met, visit Cox Chevy.